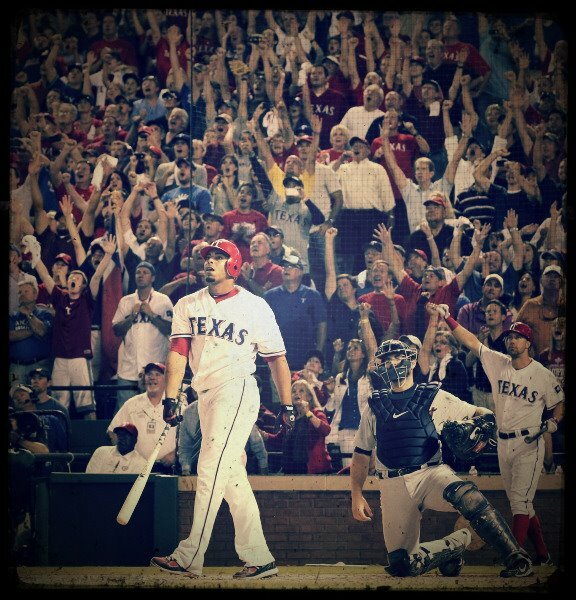 Bit Of Byrd: Texas Rangers Walk off Grand Slam? I live in Texas and I consider myself a true fan but not a big fan of any sports really. Why do I say that? Well I am not a fair weather fan in that I don't pick other teams if my teams are not doing well. But I am not a big fan in that I don't follow every game and I don't know sports terms. So when I woke up this morning to Facebook feeds that only talked about a walk off grand slam I had no idea what that meant. I knew it was talking about the Texas Ranger's game... and that we won. So while my blog is not really about sports, I hate feeling out of the loop. Did you know I could not find a more reputable source containing a clear definition than Wikipedia? A walk off home run is a home run that ends the game. Sounds simple enough. It is called a walk off because both teams walk off the field after the home run is hit. The rest of the inning doesn't have to be played. Well in last night's game the Rangers were down and Nelson Cruz was up. He hit a grand slam, meaning the bases were loaded and he brought everyone home. This is a big deal for the Texas Rangers for a few reasons. A main one being we are in the play offs and this was a win for game 2. I know many people who were at the game, or stayed up late to watch it. I was in bed. But I am glad I know what is going on now.